Invention Ideas for kids: Successful invention ideas can take years to develop or can be inspired overnight. Great invention ideas can be developed by using the creative process to produce a unique device or process that results in a new solution to an existing problem. Innovative ideas result in an improvement to an existing device or process. Invention Ideas for kids: The key to creating great invention ideas is to identify a problem and then to come up with a new way to resolve it. Successful invention ideas are inspired by using imagination and ingenuity in order to devise new inventions and useful innovations. Invention ideas do not need to be complicated, some of the best invention ideas are very simple. If you are a student looking for invention suggestions for a school project, homework or a science fair then this article will give you some inspiration to get you started. Invention Ideas for kids - Inspiration: Coming up with invention ideas should never be a chore. Choose a general subject that you are interested in and start imaging ways to improve or create a completely new 'take' on the subject. Invention Ideas for kids - Hobbies: Consider popular hobbies such as gardening, exercise, entertaining, shopping, travelling, sewing, socializing, cooking, camping, bicycling, playing and sports related hobbies. Are there any difficulties or problems that are associated with these hobbies. Are there any ways that experiences can be improved? Invention Ideas for kids - Simplicity: Many of the devices we used today are unnecessarily complicated. Most people like simplicity. And simple devices and appliances are less prone to developing faults. Looking at existing items can spark invention ideas for a novel device or process. Look for any improvements that can be made on existing machines or products to make them more practical. You do not have to be an expert - many ideas are just not obvious to others who are experts in the field. Invention Ideas for kids - Making life easier! : Think of everyday items that could be improved to make life easier or more comfortable. Discuss this with other people, get their ideas. Have a chat if you can with people who have disabilities. Or get into a discussion with older people, who often have difficulties with objects that younger people do not have problems with. Invention Ideas for kids - The Environment: Much of our attention is directed towards making the environment better and safer. Consider any problems associated with recycling - this might well lead you to some unusual invention ideas. Invention Ideas for kids - Household Chores: Nobody likes doing household chores! Is there any way these could be made quicker or easier? An annoying household chore is struggling to change quilt covers - especially for older people and those who live on their own. Also consider the types of fastening used for quilt covers. Invention Ideas for kids - Combinations: Create invention ideas by taking two existing products and put them together to create a completely new device or product. Invention Ideas for kids - Project File: Any invention ideas should be kept in a project file. Keep records or a diary of conversations and suggestions. Start taking photographs and making drawings. Make notes and do not discount any ideas - these might prove extremely useful as time goes on. Invention Ideas for kids - Failure: Be prepared for change and failure! You may well get excited about an idea but with hindsight discover that it is impractical to implement. Mistakes can be made but if you have confidence in your idea don't give up. Invention Ideas for kids - Morphing Inventions: On the subject of change and invention idea might become simpler and more practical or conversely might expand. It is always possible that an idea may even morph (modified) into something totally different. Invention Ideas for kids - Thomas Edison Quotes: Thomas Edison was one of America's more prolific inventors. Two of his quotes are particularly relevant to those working on invention ideas. On the subject of failure Edison said "I have not failed. I've just found 10,000 ways that won't work." Invention Ideas for kids - Perseverance: All inventors must learn to persevere with their inventions if they believe they will be successful. On the subject of perseverance Thomas Edison said "Many of life's failures are people who did not realize how close they were to success when they gave up." Invention Ideas for kids - New possibilities: Use your imagination and ingenuity to find new possibilities with your ideas. Inventive thinking often involves combining concepts or elements from different ideas that would not normally be put together. Invention Ideas for kids - Inventiveness: Define Inventiveness: Inventiveness means harnessing the power of creative imagination. Think "outside the box". 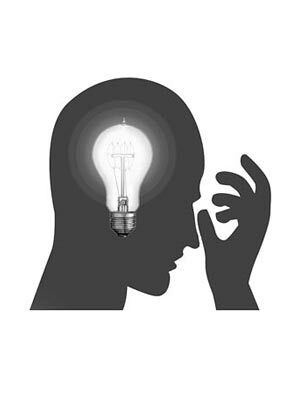 Use the indirect approach of 'lateral thinking' to view the invention concept in a new and unusual light. Example: Think of an everyday item such as a chair. A chair is not just for sitting on, it can be used to stand on like a ladder or turned upside down for kids to use as a tunnel, put a cover over it and you have a tent. Invention Ideas for kids - Explore: Explore the world around you. Observe things in a different light. Look at items and products and start thinking about different ways they might be used - that's inventiveness. Invention Ideas for kids - Visualization: Use visualization to form a mental image of your concept. Let your imagination help you. Make a drawing of your mental picture to help you to remember your mental picture or visualization. Invention Ideas for kids - Presentation: If you are working on Invention ideas for a school project or homework it is not often necessary to actually create the product or device. Your idea can be conveyed on paper with notes, drawings, photographs and research findings to supplement your idea. Choose a large piece of paper headed with your name, date and the title of your invention. Write a short sentence to describe the purpose and benefits of the idea. Create a drawing of your invention using arrows and text to highlight important elements. It would also be helpful to indicate the size of the item to help your teacher visualize the idea. Invention Ideas: We hope that the information in this article have provided the answers to your questions about Invention Ideas.